If you’re considering a cat wall system, there are many different types of products available to you. In this article we'll explore the different types of cat wall shelves, and the benefits of each of these styles. 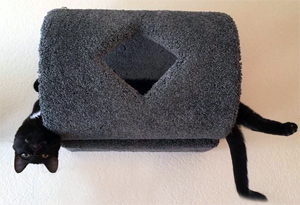 We offer a large variety of cat wall shelves and climbing components that are covered entirely in carpeting. These high-quality components have solid wood or industrial strength underlying bases and are covered in plush, household grade cut-pile non-loop carpeting. Choose from a wide variety of carpet colors to match your home’s décor, and provide your cat a comfortable, cushy vertical world for lounging and climbing. "I ordered a cat cup some months back in hopes my cat would like it. Here I am now looking at him in it nearly every night. He loves it so much! I'm so glad I got it! Easy to hang and feels strong and sturdy when mounted on the wall." 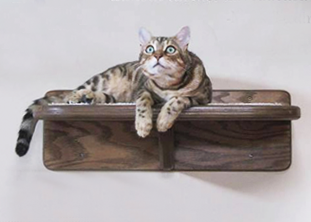 If you are seeking a more traditional style of cat wall shelf, consider a selection from our wooden cat shelves. Whether you prefer a rustic style shelf system to match your decor, or perhaps a contemporary curved shelf, you'll be sure to find something to your AND your cat's liking! We do offer custom made shelves that allow you to pick a stain color of your choice, to more closely compliment your home. "Beautiful cat shelves. My husband installed them quite easily, and he's pretty handy, and I didn't hear any complaints or issues. We coaxed our 16 year old cat up there with a brush as she loves to be pet and brushed. She's too old to be making huge leaps, and she won't stop climbing or attempting to get up high. They work very well and I would purchase them again." 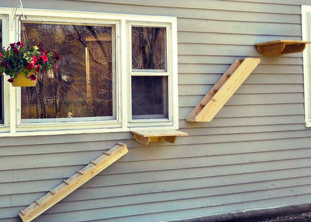 Cat shelves that attach to windows are a fantastic way to provide your indoor cat a great view of the outdoor world. Our window perches easily attach to most types of windows, and come in a variety of sizes and styles. Consider an extra large perch that accommodates multiple cats, so that they can watch the birds and wildlife outside their window together! "Fabulous window perch. Very heavy duty and will last for many years. I have a newly adopted cat and bought the tub type perch and she loves it. Wouldn't even consider buying a window perch from anywhere else. This company knows how to build quality cat items! Thank you." 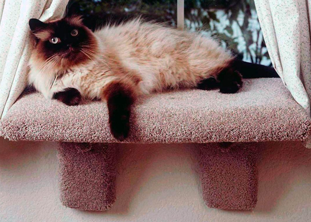 Do you have the perfect space for a cat wall system that's more whimsical and unusual? 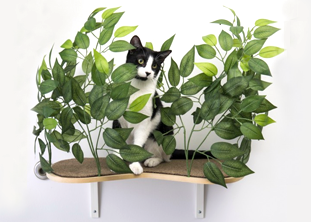 We offer a number of novelty cat wall shelves that include shelves accented with natural looking silk leaves, or shelves that are in the shape of a cat paw, to name a few. Your cats will enjoy these fun and functional novelty items. "I love these shelves because they look great in my house, while still allowing my cats to run up into their hiding spot :)"
The latest edition to our collection of cat wall shelves are perches and ramps that are intended for outdoor use. Yes, these components can be mounted right on the side of a house or structure, and allow outdoor cats to climb, play and lounge comfortably! Made from solid cedar. "My outdoor cat LOVEs these shelves! My indoor cat and my outdoor cat checked it out on the very first day!"